Hainan may be China’s southern most province, but it is not untouched by the modern growth of the country. New hotels, apartments, businesses, roads and tourist developments are being built and opened every day. While many ancient rituals fight to keep their presence in one of the fastest growing economies in the world, food, and its roots in traditional culture, remains very much alive. Inland, where pockets of Li culture are still visible, Li cuisine takes a front row. Armed with a number of signature dishes known for their fresh flavours, Li food is still enjoyed widely across the island today. While staple Li foods are rice, corn and sweet potato, they are also well known for their unique preparation of meat and vegetables; not least, their bamboo pole rice. The names given to dishes are particularly inventive. On any Li menu you could expect to find river eel, rainforest deer, surfing fish, five-legged pig, smoked egg in hot spring and horses hoof grass. Other general Hainan dishes that can’t be neglected are Wenchang Chicken, Jiaji Duc and Dongshan Mutton. But moving back to the coast, seafood is the real drawcard. 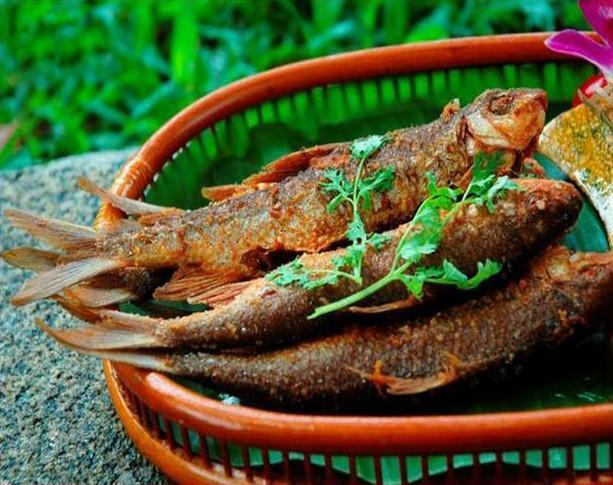 Ranging from street stalls where you can see your dinner splashing in the tank to high-end restaurants, it’s easy to treat yourself to a seafood feast in Hainan. You will enjoy tuna, crab, mussels, kind prawns, oysters, abalone, sea cucumbers and many other delicacies such as coconut squid; all freshly prepared. Hele crab is a favourite and famous for its tough shell and fresh and tender meat. For a look at the work behind this delicious fare, visitors to Nanwan Monkey Island are able to enter the specialised sanctuary for more than 1,500 macaque monkeys through a lively fishing village. Hundreds of boats sit moored in the midday sun waiting for night to fall so they can head back out to sea. 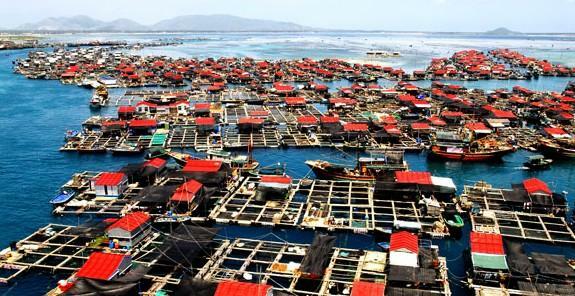 Small houses and businesses float on giant rafts, in between fish farms. One structure is a restaurant complex where day-trippers can take advantage of seafood caught fresh on the day. Otherwise, there are plenty of fishing boats to take a look at in downtown Sanya.